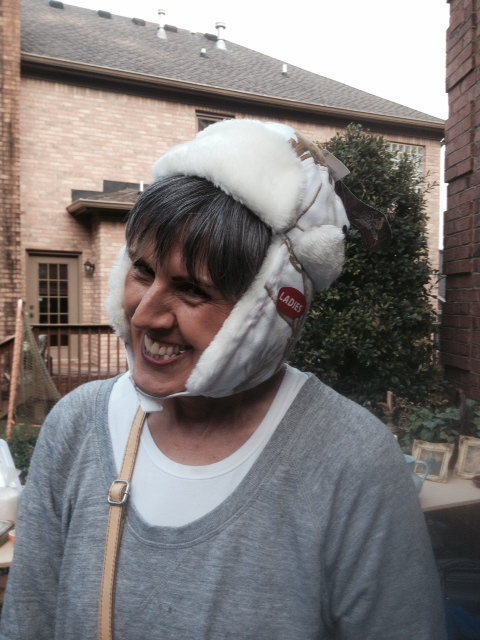 And generally terrorizing entertaining sellers at yard sales we were. “Is this your impersonation of Yoda?” Jabber inquired. Approaching the first sale in a nice neighborhood, we noted that the front windows were open and a workman was doing something at the window sill. 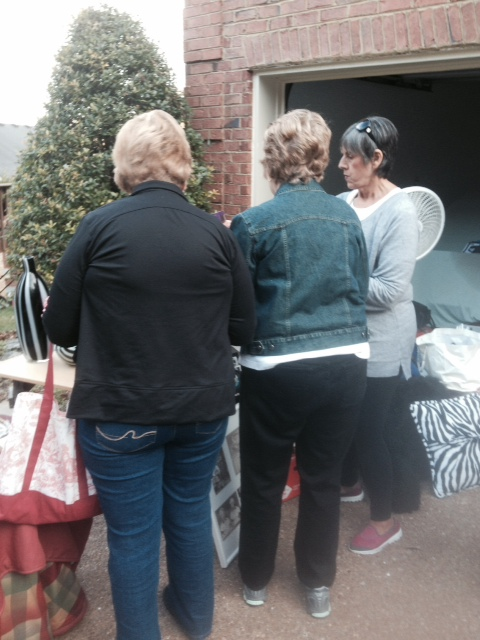 We walked up the driveway and viewed the items, seeing that a woman was standing there—the seller no doubt. 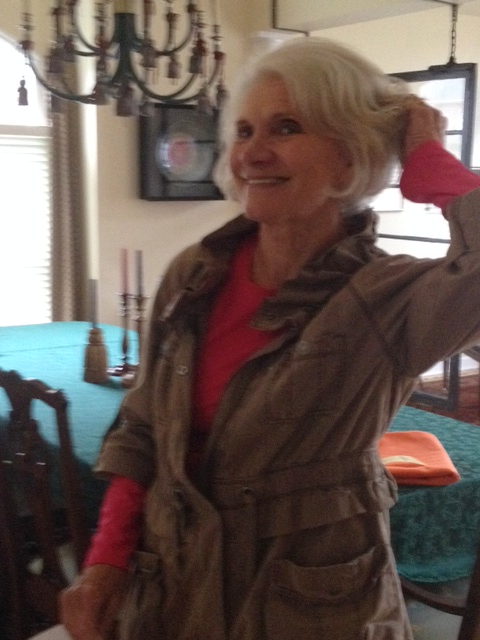 I was standing next to her……. A deep male voice boomed, “That’s $5 and it’s a good one!” The male voice startled us both and Girlfriend looked up and around befuddled. Whereupon, of course, we all collapsed (metaphorically, not literally) in gales of laughter. The voice came from the workman, of course, the other seller/homeowner, who we had forgotten was working on the window nearby. They fit. Jabber had the perfect pose. Above, Jabber does the pirouette (or some such). Alas, the Brocanters advised that it wasn’t her. 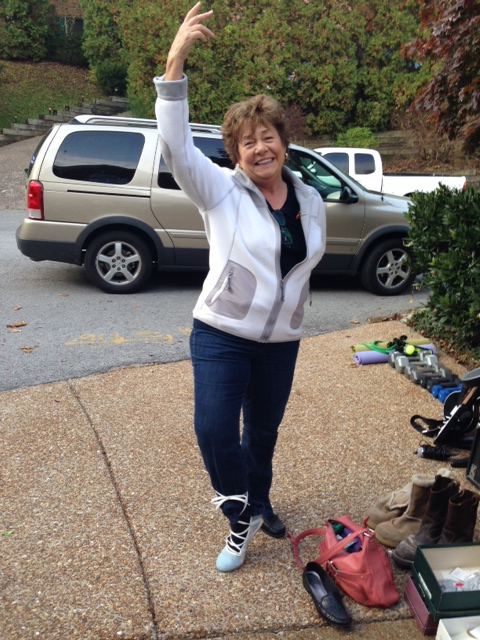 Jabber left the shoes—they were only $4 and in mint condition! Oh my………..sad she was. But she did buy the waffle iron. $5. Flips over to be a flat griddle. “God” was right. Buy!!! 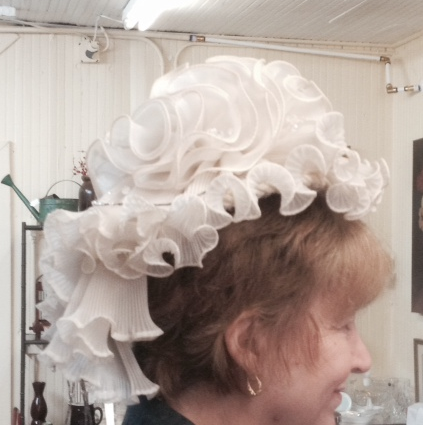 Seriously considering something or another…..
Vanna found THIS! for her daughter-in-law. She reported it will be just perfect for her! 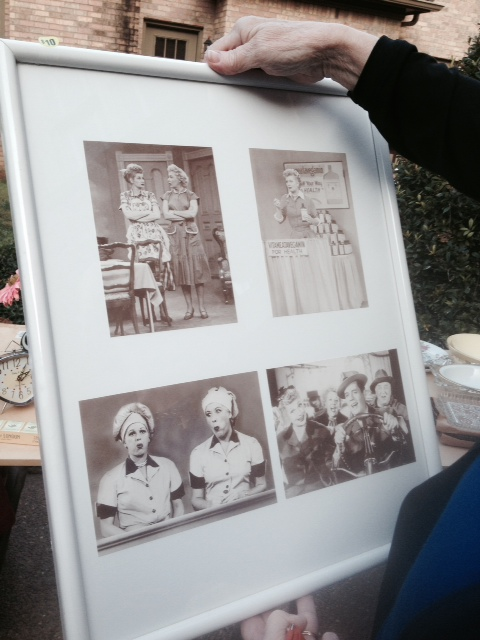 Thumper acquired this set of pictures from the Lucille Ball show—perfect, said Thumper! Seems she and her real sisters like to pretend they are Lucy and Ethel and often have conversations similar to some of the TV shows. And we laughed ourselves silly. 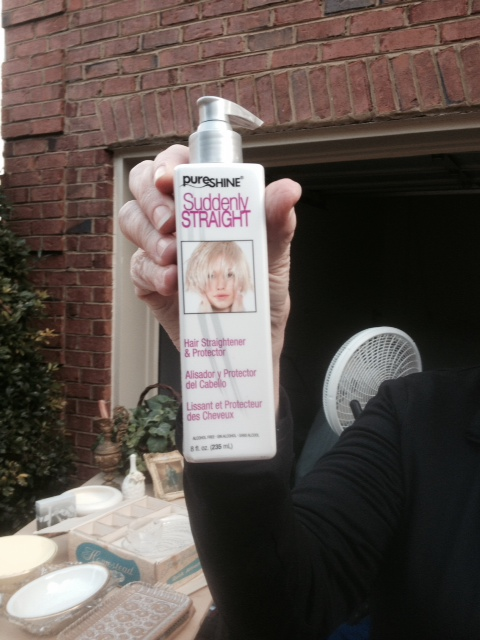 The seller was looking at us all oddly by now……..mumbling something about straightening her hair and how she’d used that and, well……….we were paying her no attention. 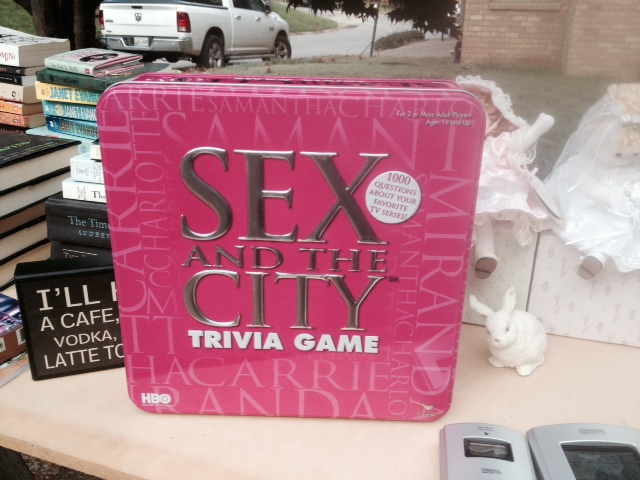 And then Thumper spotted this and reported she could ‘ace’ that game, having watched about every single episode several times……. We don’t know a lot about Thumper’s past. This is a concern. Moving on, it was the usual Thumper and Vanna show in the back of the van. Those two can come up with the strangest funniest conversations ever. Continuity has nothing to do with said conversations, either. Jump from one topic—say, where to go for lunch?—to the price of toilet paper ($1 a roll Thumper reported!) in one breath. Always a challenging and stimulating conversation, let me tell you. Driving along through the country roads where we THOUGHT we knew where we were—but didn’t exactly……. an antique shop located on Old Hillsboro Road near Franklin, Tn. We stumbled upon it—well, actually we WERE looking for it, but didn’t realize it was on the road on which we were lost. Truly God does help idiots and drunks. But she didn’t need it. Had the same hubby for decades and doesn’t desire a change. 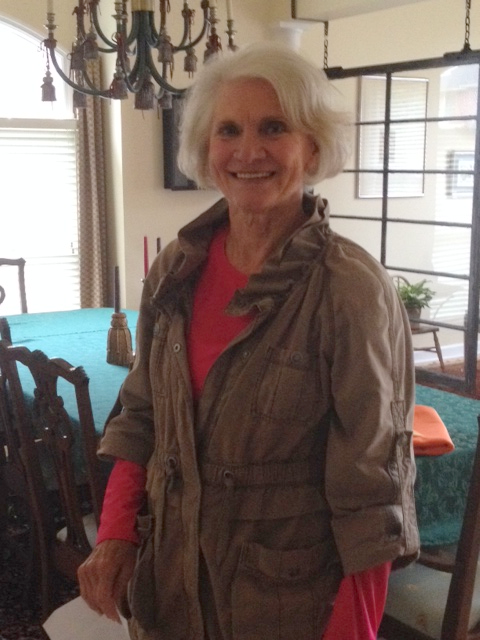 Besides, the jeans jacket just didn’t work with it. Southern Fried Patinas is moving their location to Tag—they are in the process now of moving in. Be sure to hop on over to see what they have to offer soon! We decided someone really had too much time on her/his hands with this one. 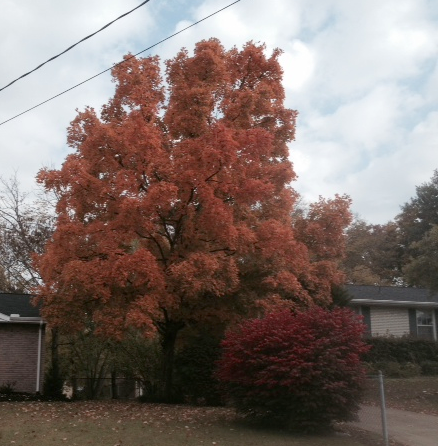 Spectacular colors in the tree and bush in this neighborhood! 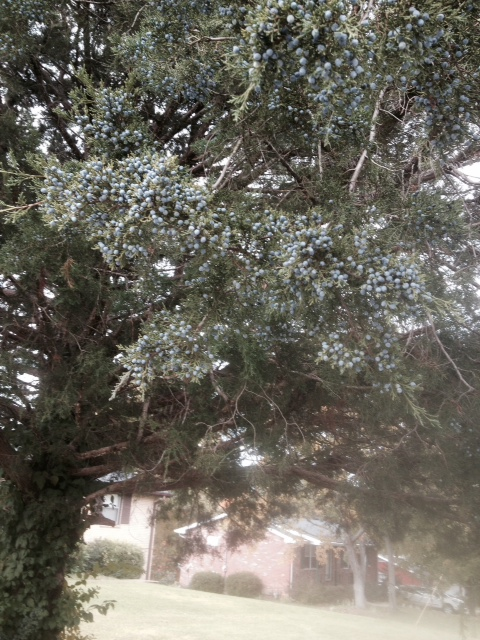 Beautiful berries—blue!—in this tree. I believe it is a Blue Cedar tree! 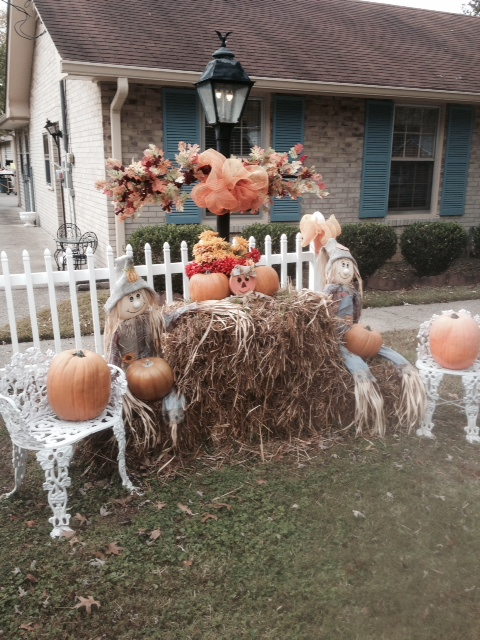 A charming display by homeowners above—these people were retired and had beautiful furniture to sell. They’d updated their look inside the home. 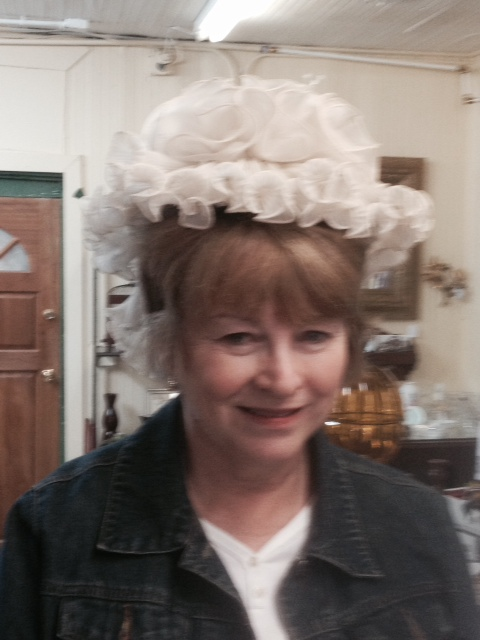 Unfortunately, our homes are not in need of more furniture, so we had to pass up the excellent items for sale. 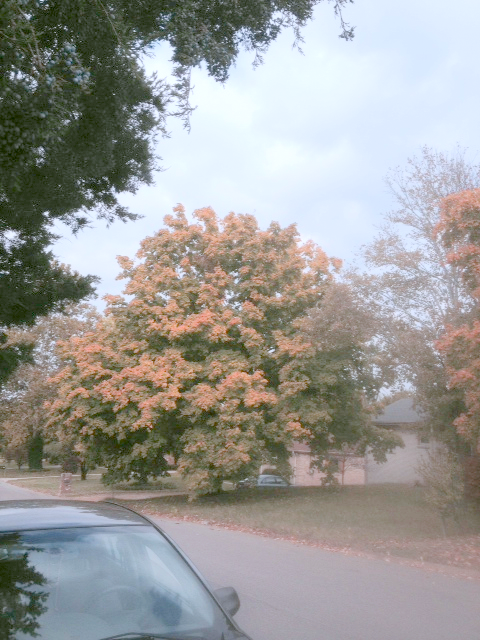 Yet another spectacular orange tree. Our adventures to parts unknown, a new antique store and just generally being a bit lost had made us hungry. So we went to Corner Pub and had lunch. 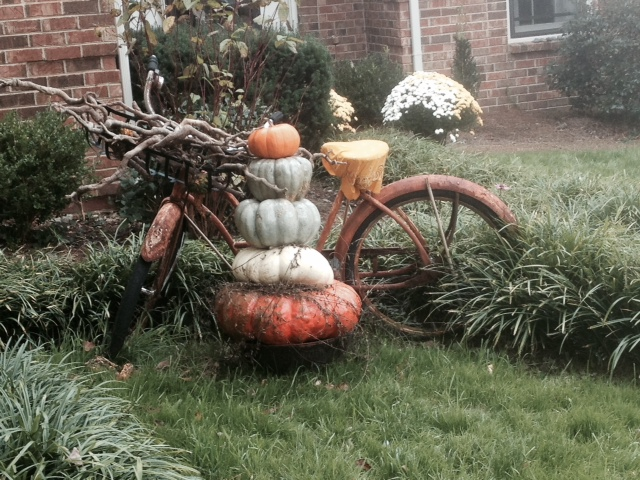 Hope you, too, got out and about and saw some fun and interesting sights in your area this beautiful Saturday. Mother Nature is putting on quite a show this year, so be sure to enjoy it! Hit the jackpot the past couple of weeks! 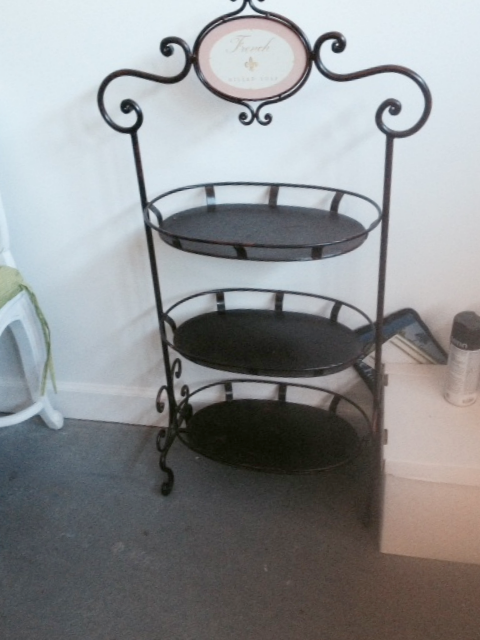 This is an antique display stand, likely from a store display. 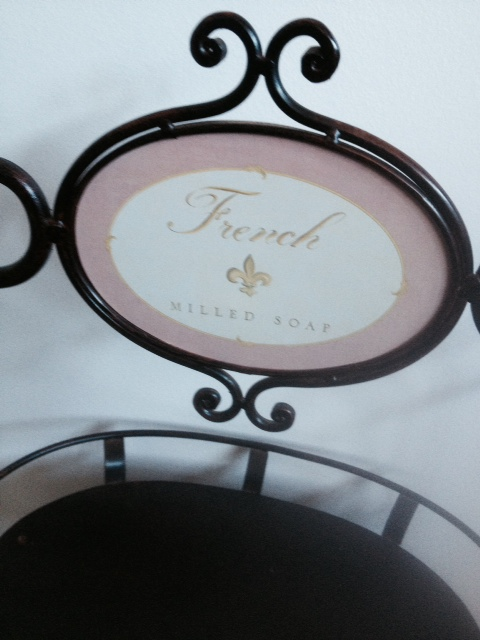 It says “French Milled Soap”. 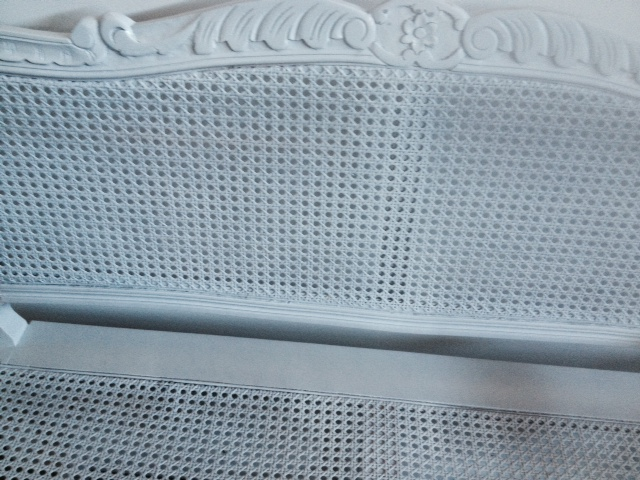 And I KNOW it’s likely a real antique because the metal finish wipes off with a damp cloth. Will be needing daughter’s assistance to fix this potential problem. But it works perfectly in the master bath! 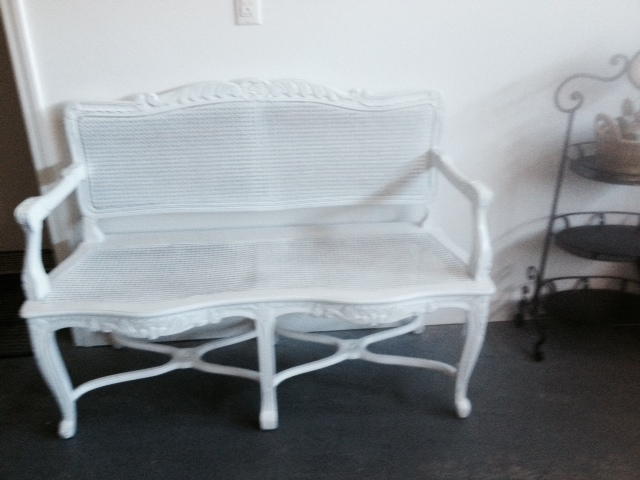 French bench, mint condition, with caning. It came with a seat cushion, also in very good condition. I’m loving the bench, but will ask Daughter to distress and glaze it a bit—and it will live, at least for a while, in the living room. 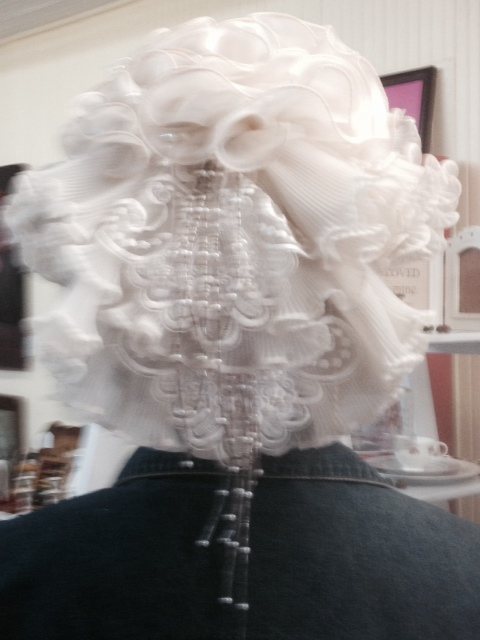 I will show photos later. A reproduction of a French laundry cart—actually two of them were sold together, so I bought one for me and one for Daughter to use potentially as a display item. 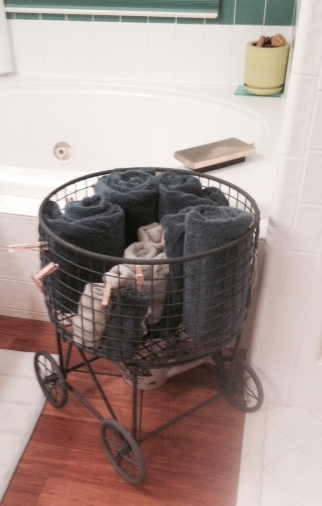 I opted to store rolled towels in the master bath in the cart, but pillows, or about anything you can think of would look cute. Yard sales. You can find anything at yard sales—it requires two things: patience and persistence. And a little bit of money—much less than retail! So you want to know what I paid for the items above, don’t you? A while back, having not too much to do, I decided to paint my pig, doing, of course, what everyone does when she has some free time on her hands. YES?? Well, what do YOU do when you have some free time? And awaiting a chance to show himself off to the world—or at least visitors to the kitchen. He waited. And waited. Finally, CCQ Daughter came to assist. 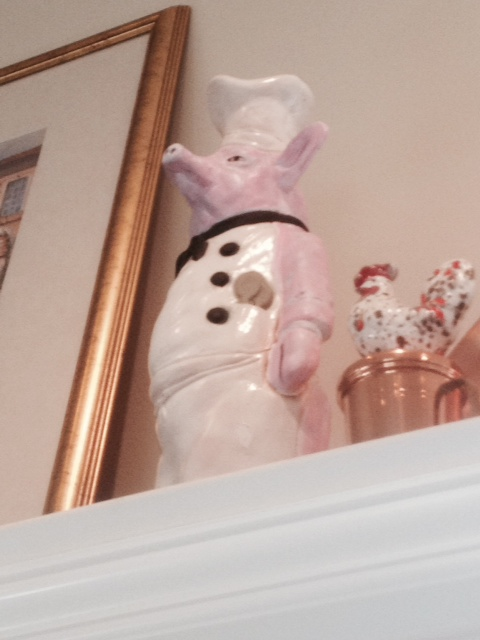 It became obvious from cries coming from the attic that Porkie wished to join Pinkie. 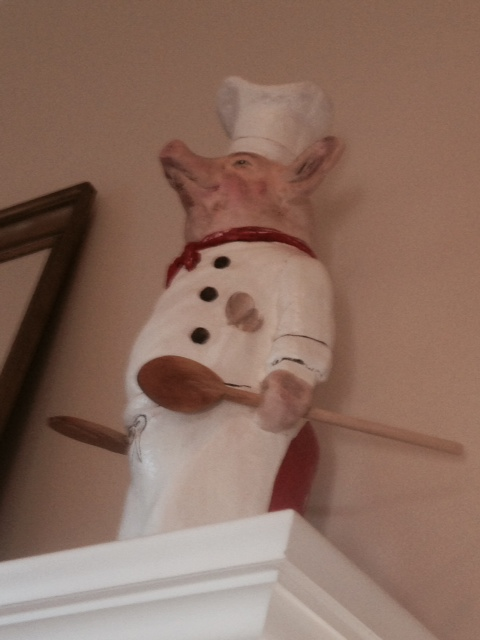 Porkie had been placed in storage until such time as his services were again required. They were again required. 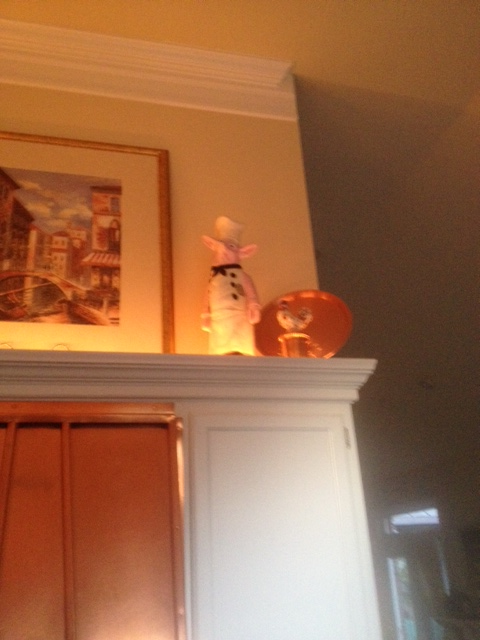 So yesterday, Porkie emerged from his hibernation and he and Pinkie climbed up to the top of the kitchen cabinets to their rightful places in the kitchen. 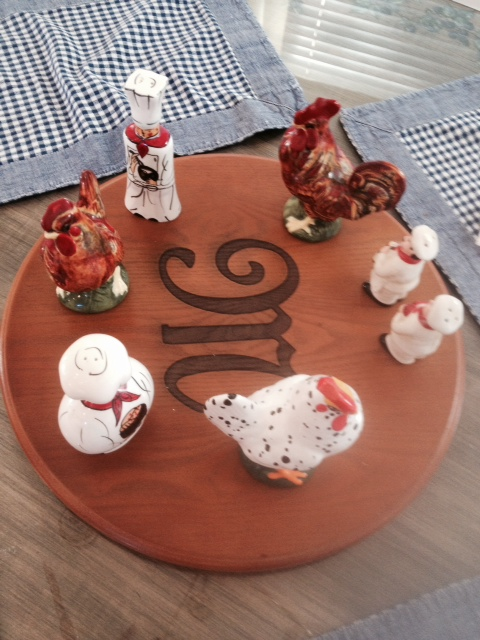 I’m not sure the roosters and chickens were pleased however. Seems that there is an ugly rumor going around that there will be a chicken in every pot and they might be said chickens. I will report. Pinkie and Porkie are distant cousins, I’m told. 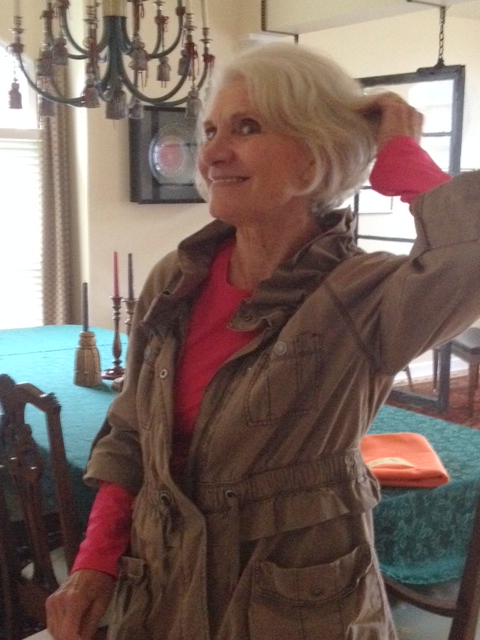 Both trained in the culinary arts at fine schools, one on the west coast in Napa Valley and the other in France. 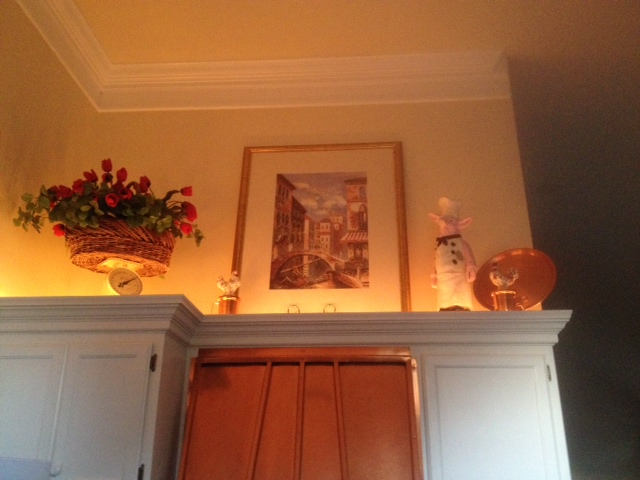 Thus, I have kept the illusion of having a French kitchen. Julia, I know you are jealous! Note chicken on left has kept far away from Pinkie. Smart chicken. 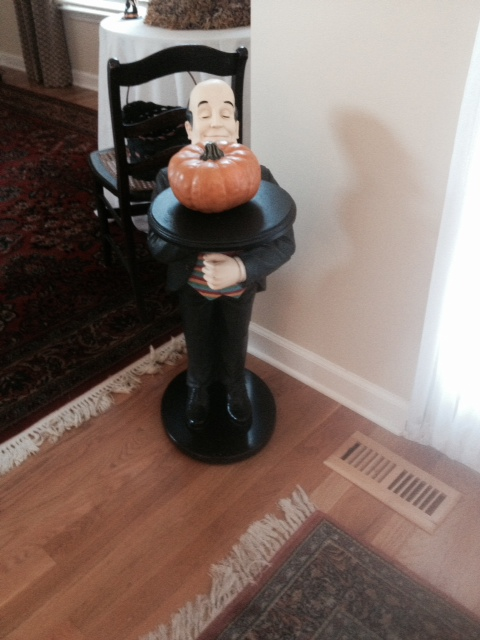 Not to be outdone, which he never is, Henri Poirot obtained a pumpkin for his tray and stands at attention by the front door. That’s not right. Pinkie and Porkie are the hams. You want to know why her dog is named Mr. T? Well, that was so he could be anything he wanted to be when he grew up. Turns out he wanted to be a dog. Just begs the question, ‘What’s in a name?’ doesn’t it? Okay—that’s pretty harrowing hilarious. But I don’t want to go to Costa Rica. Certainly not to this resort! 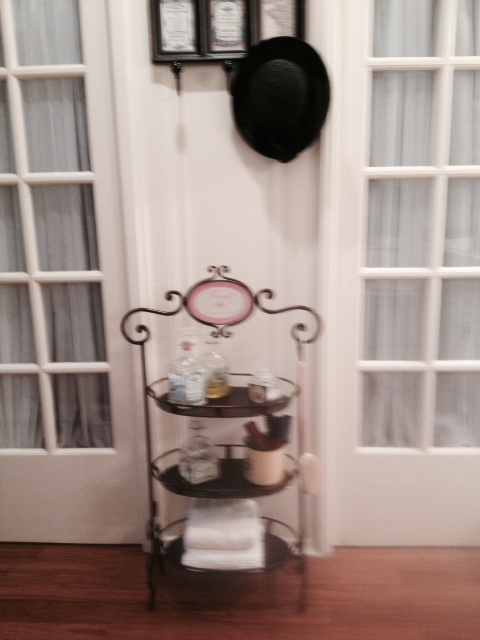 Although she went on to report she had a marvelous massage and thoroughly enjoyed herself otherwise. I guess with little sleep—that bathroom chair must have become pretty hard to sleep in after the first night? Not to mention, well SHE never mentions, who was feeding the monkeys, anyway? Did the dog go home when the tide went out? Wouldn’t he have gotten cleaner with Tide? This recipe is from our “Leader” and she made and brought it to share after class yesterday along with her homemade Muscatine Grape Jelly/Jam. Delish! A woman of many talents besides physical fitness—she gardens extensively, grew the grapes and made the jelly/jam herself. Looks like a model, doesn’t she! Pour dry Quick oats into a medium-large size bowl. Sift in mixture of other dry ingredients (she used a small food processor instead of a sifter—faster and easier on the hands). Stir dry ingredients until well mixed. Add wet ingredients and mix well with large spoon. Add raisins and/or other add-ins. Spread evenly in greased baking pan and bake for 40-45 minutes. Toothpick inserted should come out clean, but will be moist. Cool for 10 minutes. Use a dull knife to loosen around the edges, leaving the loaf in the pan. Cover with foil and let sit for 1/2 hour. NO TASTING! Loosen again with the knife, lifting gently as you go around the loaf until it fully separates from the pan. Then turn pan over; it should come out easily. Wrap in foil and store in the refrigerator. Serve cold, room temperature, toast lightly or heat slices in microwave for 25 seconds. Enjoy plain, or with cream cheese, butter, jam or Peanut Butter and Jelly. 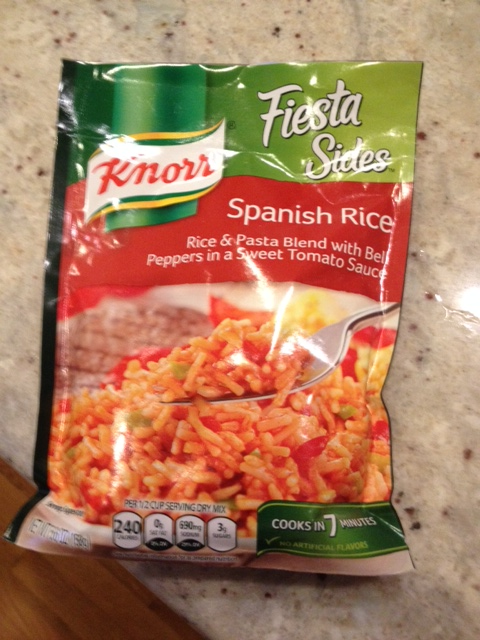 Sunday supper—something easy and quick to put together with things in the fridge and pantry. 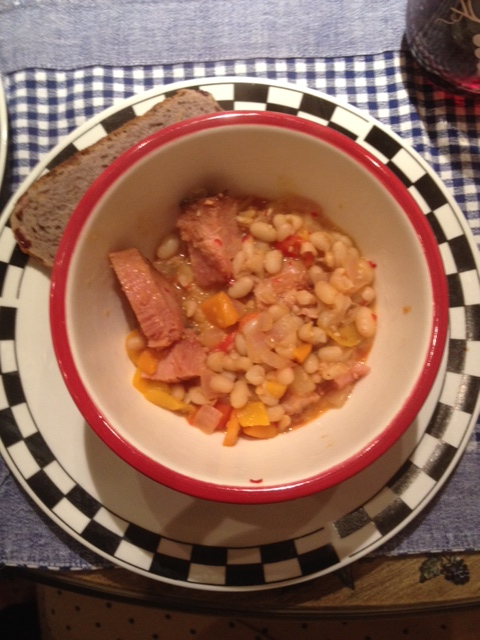 1 can white Northern beans (or any type of beans you like and/or have in the pantry). Rinse and drain. 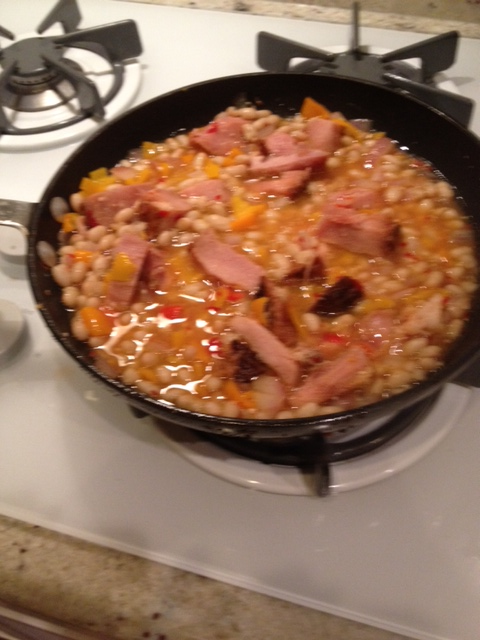 Add beans and ham chunks and heat, then add some chili sauce or paste—this is for flavor. You won’t need salt (ham is salty). Add about 1/4 cup chicken stock and about 1/4 cup white wine and allow to reduce the liquid a bit while you cook some rice. 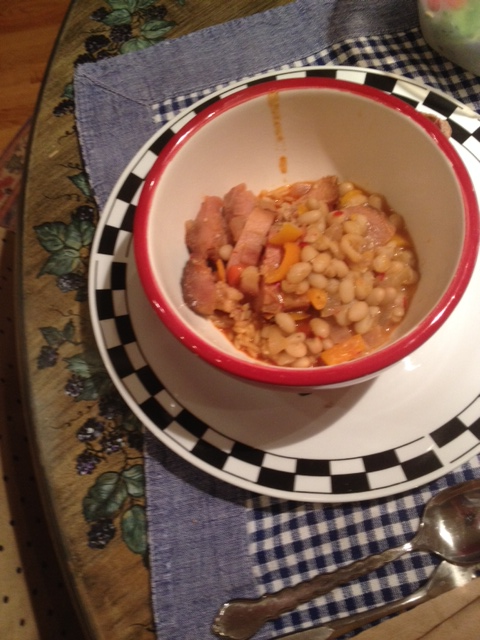 Serve the ham and beans over rice in a bowl. Season to taste, if you like. Ours didn’t require any seasoning. This is a hearty dish and could serve 4 people. Made for Racer Daughter’s birthday (and also for Thumper’s birthday a while back). 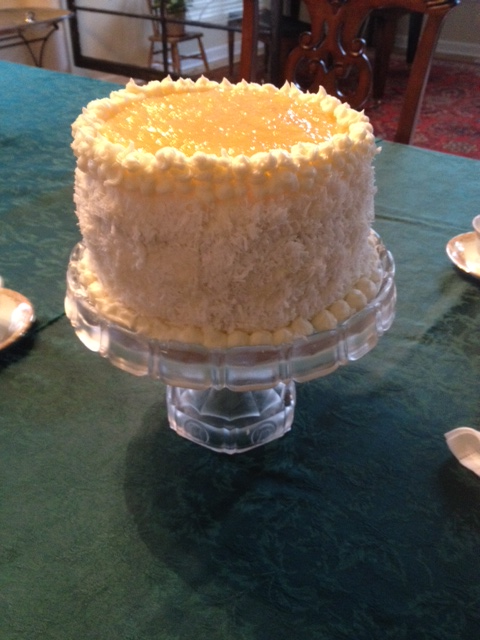 Pineapple/Coconut Cake (3 layers with cream cheese pineapple frosting and pineapple filling). 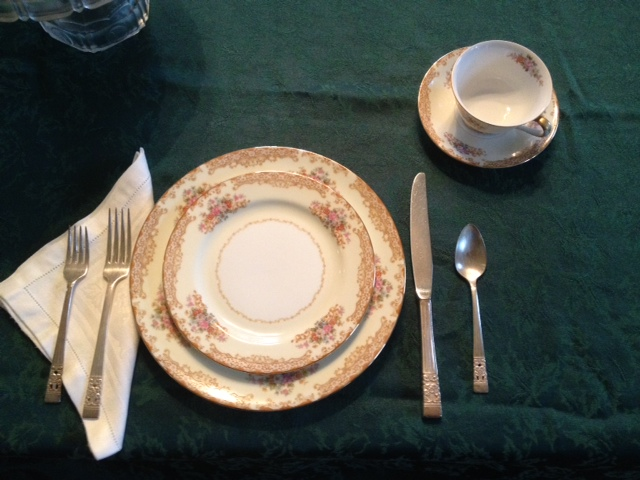 And, set the table with this beautiful Noritake china—a gift from friend Cupcake! 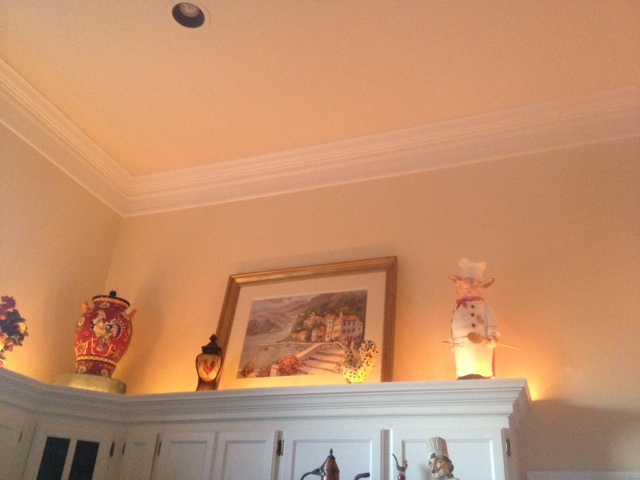 I have yet to identify the name of the China, but I’ve looked through Replacements Unlimited—to no avail. Seems there were many patterns issued with the same maker’s mark on the back of the china, but as best I can find, these are from the 1930’s. Cupcake was so generous bequeathing them to me! Thank you! They make a beautiful table setting. First, bake the three layers—I like to bake the cakes a day or so ahead of the day I plan to serve the cake, wrap and freeze them. 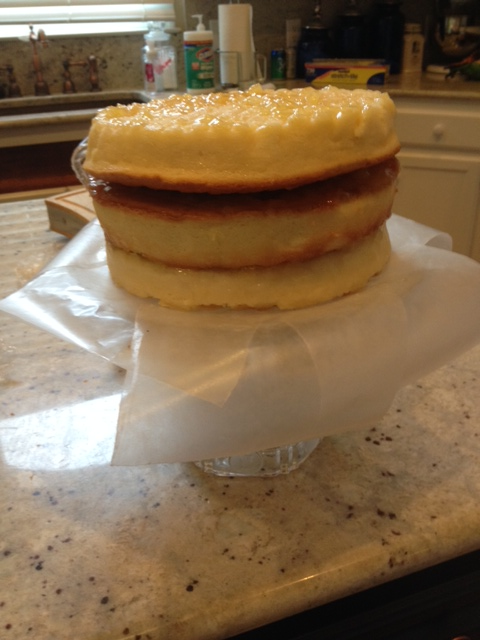 This allows for easier handling of the layers when assembling the cake. Second, you may prepare the filling and frosting ahead of time, if you like, and keep in the refrigerator until ready to assemble the cake. 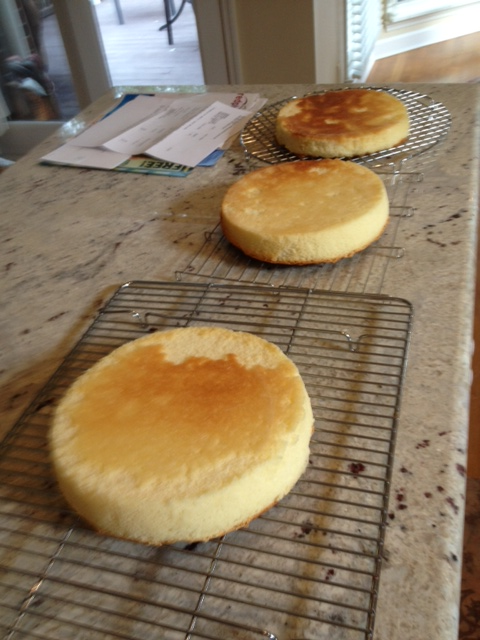 Prepare your three 9 inch cake pans: lightly spray with Pam, then cut out parchment paper circles to fit the bottom of the pans and strips to line sides of pans. I like to cut slits in the strips of paper so that the strips fit nicely on the sides. This makes removal of the cakes very easy once they are done. I also soak baking strips in water which go outside of the pans—these are oven-proof and will help your layers rise evenly (without a dome on the top). I don’t know what they are called, but you can get them at bakery supply stores or online. I place them around the sides of the pans right before I fill them with the cake batter and secure with the pins provided with the strips. Recipe for Pineapple filling and Cream Cheese frosting follows. 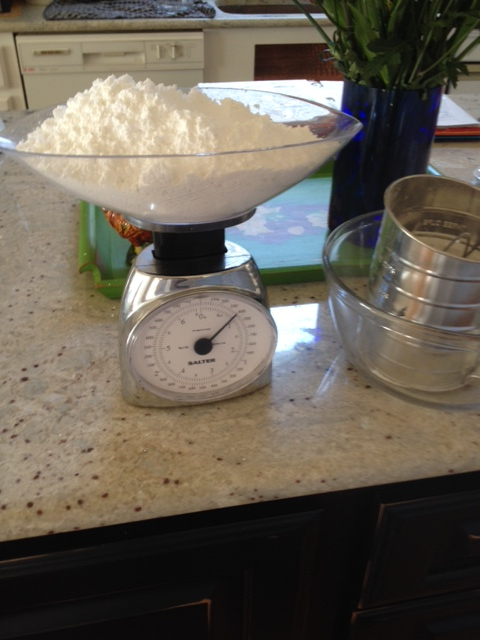 I like to measure all ingredients out first, before I begin mixing. This makes it easier to add ingredients as you are mixing the cake and also hopefully ensures you don’t leave anything out of the mixture. Set butter in mixing bowl to soften to room temperature. (Cut butter into smaller pieces so it will soften faster.) Also break eggs into separate bowl and allow to come to room temperature. Drain pineapple, reserving 3/4 cup juice. 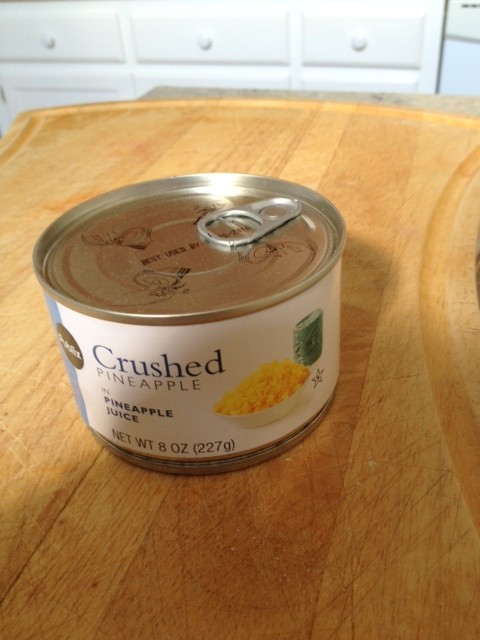 Remove 1/4 cup reserved juice for the Cream cheese frosting, and reserve crushed pineapple for Pineapple filling. 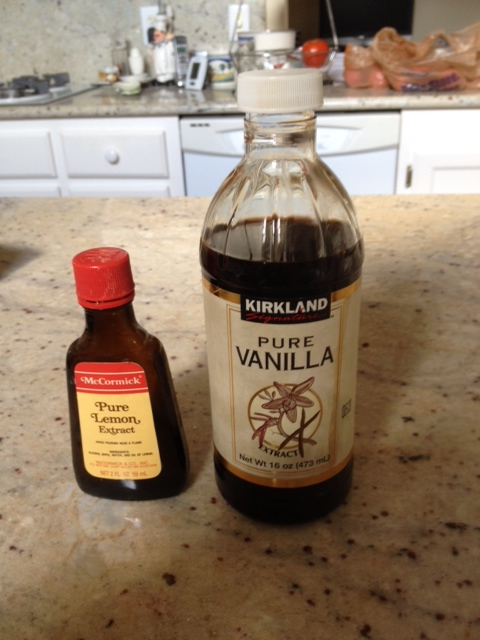 Beat butter at medium speed in electric mixer until creamy; gradually add sugar, beating well. Add eggs, 1 at a time, beating until blended after each addition. Combine 1/2 cup reserved pineapple juice and soft drink. Add flour to butter mixture alternately with juice mixture, beginning and ending with flour. Beat at low speed until blended after each addition. Stir in extracts. Now, place the outer liners (which have been soaking in water) around the cake pans (squeeze so that the strips are damp, but not dripping wet). Pour batter into prepared cake pans. Bake 350 degrees for 25 to 30 minutes or until a wooden pick inserted in center comes out clean. Let cool about 3 minutes and invert onto cooling racks immediately—remove cake pans from cake and carefully remove parchment paper. Cool completely. Wrap and freeze (clear plastic wrap), if desired. In a saucepan, stir together (I like to use a wisk for this) sugar and cornstarch. 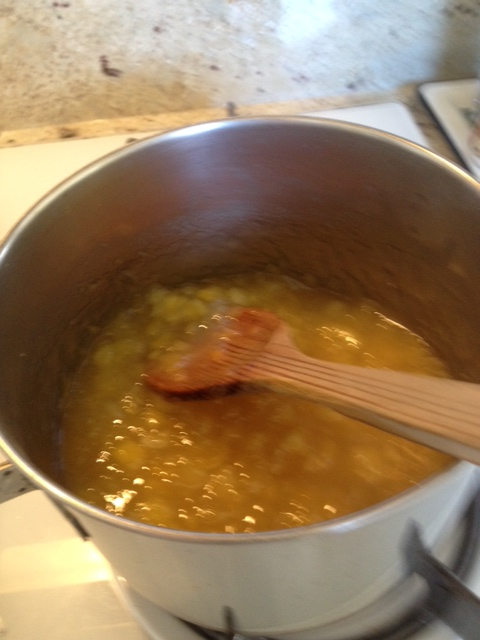 Then, stir in pineapple and 1 cup water. Cook over low heat, stirring often, 15 minutes or until very thick. Cool COMPLETELY. Makes 3 cups. You can make this ahead of time and place in refrigerator until assembling cake. 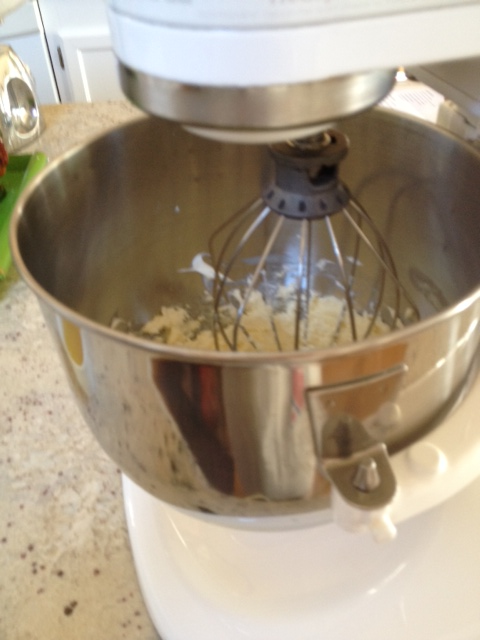 Beat softened butter and cream cheese at medium speed with electric mixer until blended. Gradually add powdered sugar (or you will have a cloud of sugar all over you! ), juice, vanilla, mixing well. Makes 2 cups. 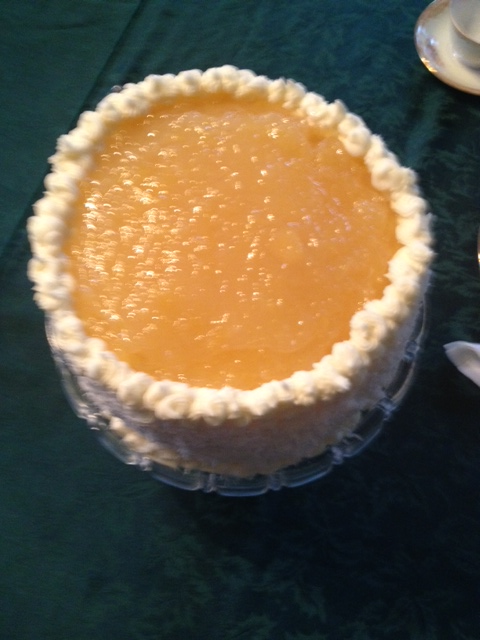 Place about 1/2 to 2/3 cups or so of the pineapple filling on top of this layer. It is best done when the cake layer has defrosted almost completely. *If you have the time, you can set the cake in the refrigerator. This will firm up the pineapple filling and also allow the cake to completely defrost. Remove the second layer from the freezer and allow to partially defrost, but still firm enough to handle. When it is, place on top of first layer and let it defrost completely. Place more pineapple filling on top of this layer. Remove third layer from freezer and allow to almost defrost completely. 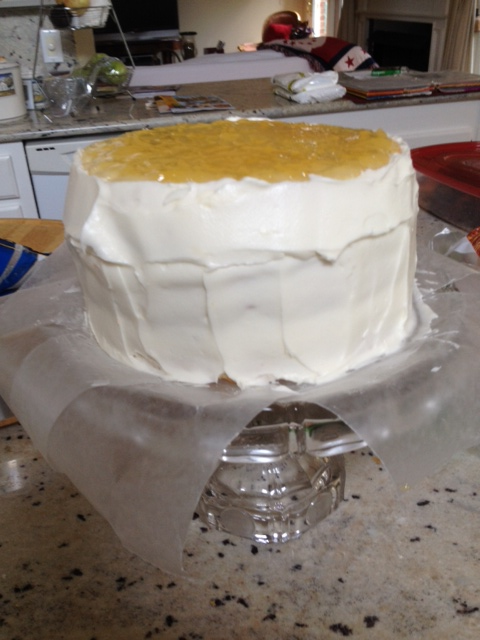 Place only a THIN layer of the pineapple filling on top of the third layer. You will have more pineapple filling to use on top once you have the sides completed. 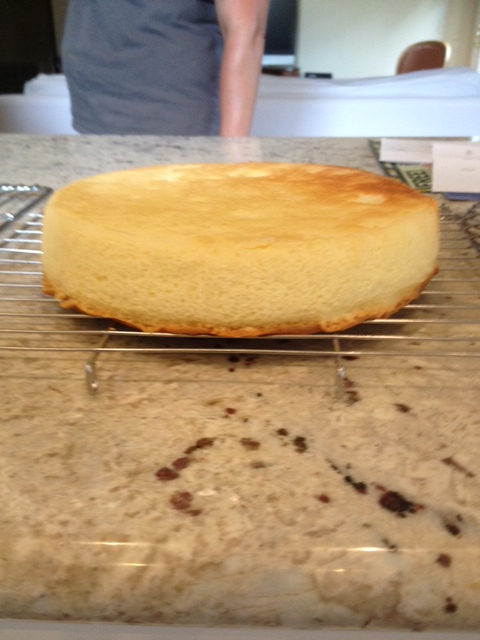 *Note that this takes time, but it is helpful to complete a nicely filled and ‘straight’ cake when done. Frost the sides of the cake with the cream cheese frosting. 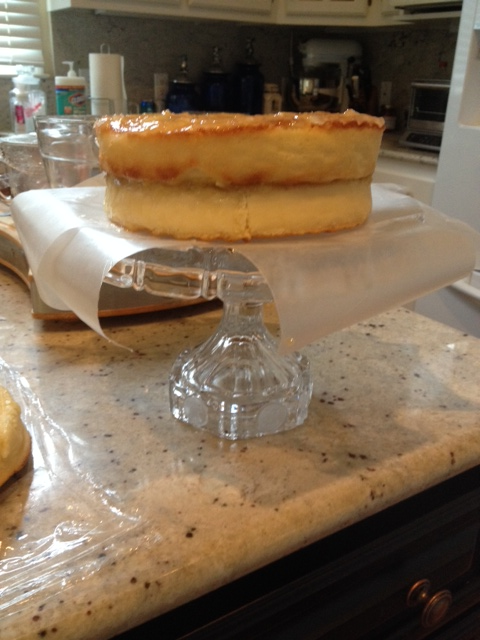 Pipe around the top of the cake to build up a small ‘ledge’. 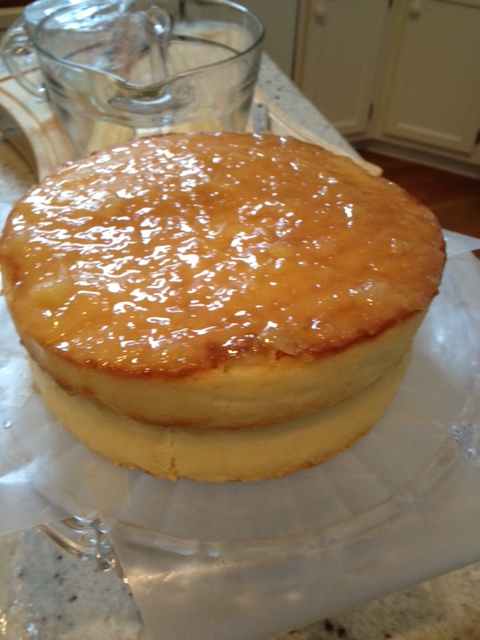 You will add the final layer of pineapple filling to the top once this is firmed up in the refrigerator. Before you place the cake back in the refrigerator, carefully add the coconut around the sides of the cake. Place in the refrigerator for a couple of hours until the cream cheese frosting is firm. Now, add the final layer of pineapple filling to the top of the cake and place back in the refrigerator until time to serve. This recipe was given to me, so I don’t know who the originator was.